I have had the pleasure of owning a travel bike for the past ten years. When I bought it, I was traveling a few times a year to different bicycle industry events around the country. Those events all followed the same script; Get off the plane, take a shuttle to the hotel, then take shuttles to event locations within five-miles. Beyond the feeling that I was being moved like cattle, it also bothered me that I wasn’t riding my bike at these bike event! To escape this cycle, I decided to bring my own bike along on the next trip. Trying to bring my bike on a plane was a too expensive for the small amount of saddle time I was going to get. So I started to look into the options for a travel bike. Taking a standard bike on an airplane inexpensively, means you need to get it into a suitcase that is airplane certified. 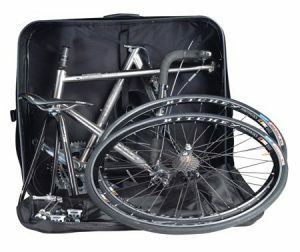 Packing your bike in a full-size bike case is also an option, but you pay steep airline fees to do so. To get your bike small enough to fit it into a case, it needs to either fold, or use couplers to split in half. I was looking for a frame that could split, because I planned to build the bike with spare parts and the parts I had wouldn’t work on a folding bike. Couplers work by replacing a portion of the top and downtube, and allow them to come apart. 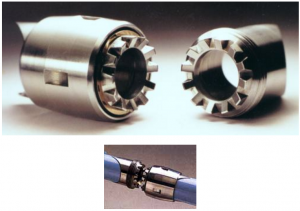 The two major players in couplers are Ritchey, and S&S. Ritchey makes complete coupler frames that include a case, pads, and cable splitters as a package. S&S couplers are modern day fine art but sold as couplers only. The downside for S&S couplers is they are expensive because you need have a custom bike built, or have them installed on an existing steel frame by a frame builder. For me, having a custom bike built was too expensive and labor intensive, so I picked a Ritchey. Outside of those coupler bikes there are packable and folding bikes available from other companies as well. The most packable bike is built by a company called Moulton. Moulton uses a cool truss design to create stiff, light, packable bicycles. I didn’t consider these bicycles only because their frames are built for small 20” wheels, and the spare wheels I had were larger. Folding bikes are also a great option we have covered here on Havefunbking.com but would also require smaller wheels. 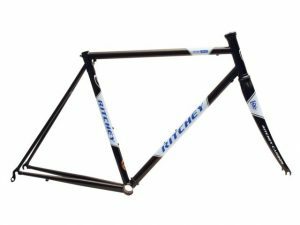 Ritchey makes complete road and cyclocross coupled frames under their “Breakaway” series. Because I wanted a bike that could handle the widest range of conditions I threw at it, I opted for the cyclocross frame. My new Ritchey Steel Cross Frame arrived in its black suitcase and I couldn’t wait to get it open. Moments later I had freed my orange and grey beauty from the packaging that had imprisoned it. I quickly built it up and took it for a spin. I was surprised at how efficient the bike felt. Somewhere in my mind I must have assumed that because it was a travel bike, there would be additional flex, more weight, or just some sort of compromised ride. The reality was that the bike rode just like a bike without couplers. It is easy to pack the Ritchey by removing the wheels, handlebar, seat and seatpost, and decoupling the frame. The resulting six parts fit neatly into the supplied Ritchey suitcase with enough room left over for a helmet, shoes and some bike gear. The supplied padding Velcros in place to protect the paint on each tube and even includes a small bag to protect the rear derailleur. To close the suitcase, just zip it up and compress the contents with the 3 exterior straps. Is a Travel Bike Really That Easy? In the years I’ve owned my bike it has treated me to thousands of miles over far away roads. I have built it in airports, hotel rooms, and conference rooms across the globe. Assembling it is easy and quick with just a folding set of hex wrenches. Even though assembly is easy, don’t forget to have the bike routinely maintained at your local bike shop. While it’s not necessary each time you travel, packing and unpacking a bike can accelerate the need for maintenance. I hope you have a similar, positive experience with your travel bike. Bringing a familiar “two wheeled friend” along on your bike journeys is the best way to explore. 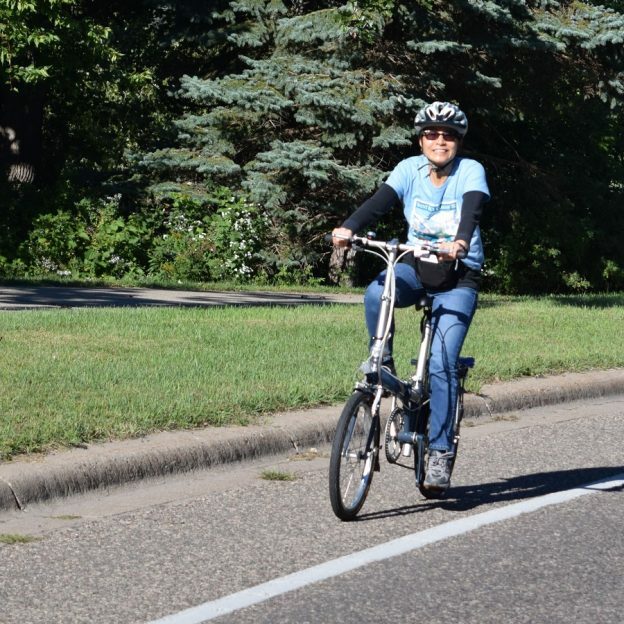 This entry was posted in and tagged #bicycle, #FindYourNextAdventure, #nextadventure, Bike Guide Minnesota, HaveFunBiking, MN Bike Guide, Mountain Biking, Ride My Bike, ritchey breakaway, S&S Coupler, Travel Bike Options on April 13, 2017 by John Brown.